It's time to dig into something sweet and delightful that can liven up our taste buds. We're going to make raspberry tart with some nuts to give it a nice texture from within. Believe it or not, a good tart baking tin is a must for getting the best results. Rest depends on how good is the tart base and your baking skills. One can add different types of berries in this tart to experiment with the flavor. If you don't like nuts, you can remove them completely. You can also experiment a bit with the custard base to induce your very own flavors. Once it is ready, your family members will push you to stop waiting for it to cool down to the room temperature. Let's prepare this divine recipe for our loved ones, now. Do make this delicious and irresistible raspberry tart preparation which also includes mixed nuts which gives it a unique and yummy flavor with a nice texture. Pulse all the crust ingredients in a dough maker with enough ice cold water to give it a nice consistency required for the tart base. Grease the tart baking tin with unsalted butter and place the dough in it. Gently tap and spread it with your hands forming an even crust layer both on the base as well as on the sides. Refrigerate the tin for at least half an hour. Bake the crust in a preheated oven at 350 degrees for about 20 minutes. Remove from the oven and bring it down to the room temperature. Except raspberries, dried nuts and icing sugar, pulse all the ingredients for few minutes until the filling gets a smooth texture. 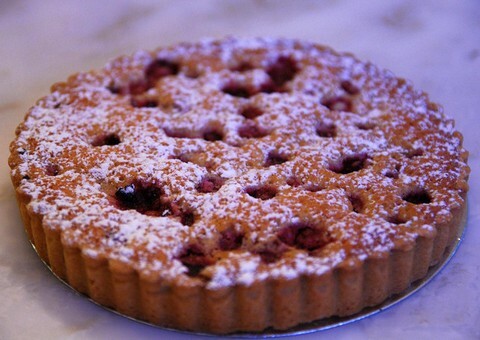 Spread dried nuts on the tart base and follow it with spreading all the raspberries on top of the nuts layer. Finish with pouring the filling mixture on top such that it just covers the raspberries. Bake in a preheated oven at 350 degrees for about 35 to 40 minutes. Let it cool down to the room temperature and carefully take out the tart on a large flat plate. Dust icing sugar on top of the tart. With a sharp knife, cut the pieces in your desired shape and serve immediately.